A female muay thai fighter performs a ritualistic dance, the wai khru ram muay prior to her bout. Here she twists her body and repeated kicks her rear leg up and down. 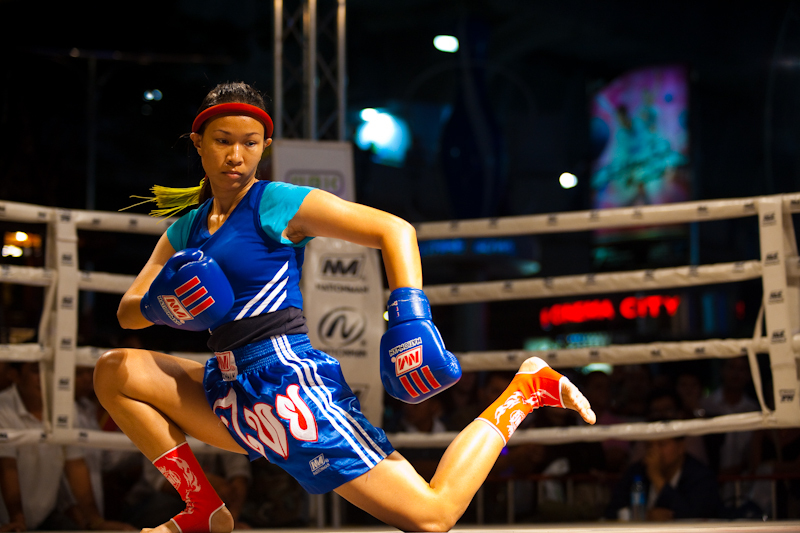 Prior to all Thai kickboxing matches, the fighters perform some variation of the wai khru ram muay, a ritual that shows respect to the boxer's trainers and teachers. Routines vary, some far more elaborate than others, all set against the background music of Thai traditional musicians. Here the figher not only kicks her leg up and down, she also rolls her fists, somewhat like an NFL referee calling a false-start penalty (sorry, non-football fans, that's the best I can do to describe the motion). 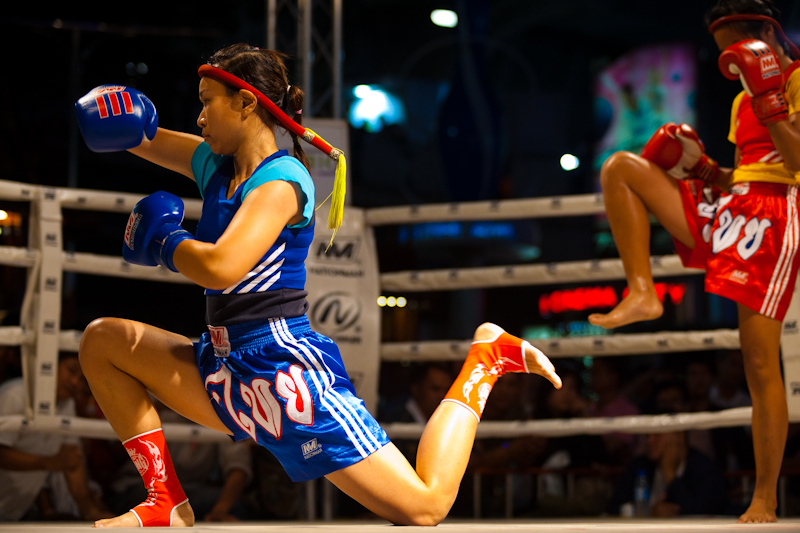 Note, in the background, the fighter's opponent is performing her own wai khru ram muay in which she steps slowly backwards kneeing the air then pivoting that same knee like a closing door. A female muay thai kickboxer bows as part of her ceremonial wai khru ram muay prior to her fight. 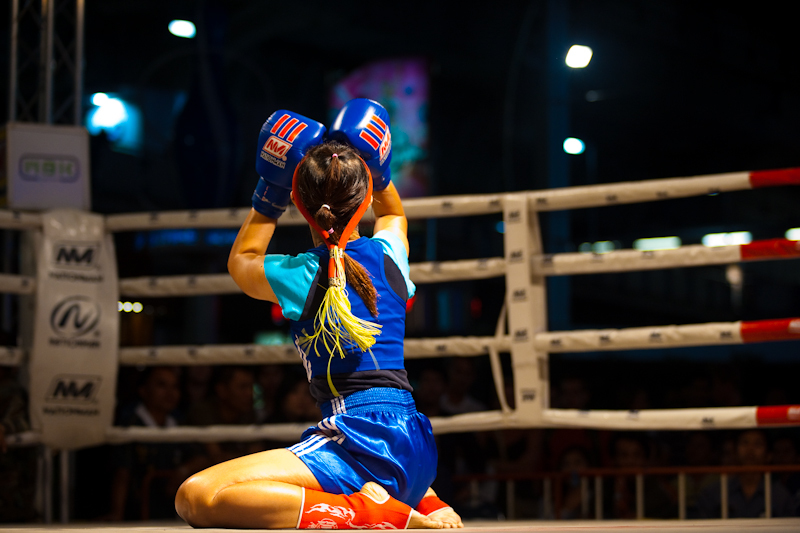 A kneeling female kickboxer performs a wai khru ram muay before her fight.